Sulfurospirillum deleyianum Schumacher et al. 1993 is the type species of the genus Sulfurospirillum. S. deleyianum is a model organism for studying sulfur reduction and dissimilatory nitrate reduction as an energy source for growth. Also, it is a prominent model organism for studying the structural and functional characteristics of cytochrome c nitrite reductase. Here, we describe the features of this organism, together with the complete genome sequence and annotation. 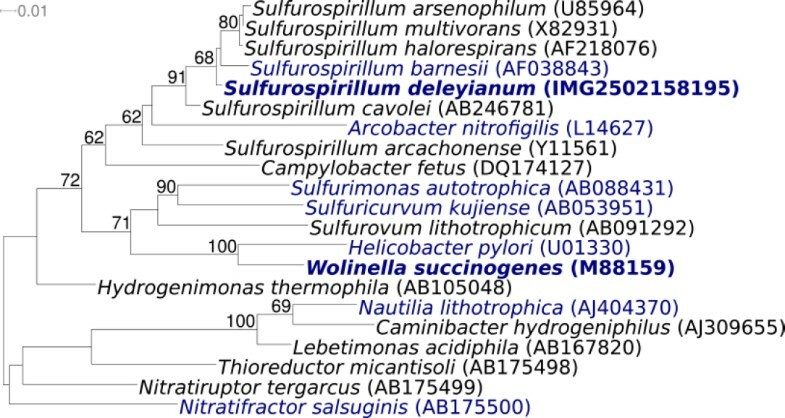 This is the first completed genome sequence of the genus Sulfurospirillum. The 2,306,351 bp long genome with its 2,291 protein-coding and 52 RNA genes is part of the Genomic Encyclopedia of Bacteria and Archaea project. Strain 5175T (= DSM 6946 = ATCC 51133 = LMG 8192) is the type strain of the species Sulfurospirillum deleyianum, which is the type species of the genus Sulfurospirillum. The genus Sulfurospirillum was originally proposed by Schumacher et al. in 1992 . The generic name Sulfurospirillum derives from the chemical element ‘sulfur’ and ‘spira’ from Latin meaning coil, a coiled bacterium that reduces sulfur . The species is named after J. De Ley, a Belgian microbiologist who significantly contributed to bacterial systematics based on genetic relationships . 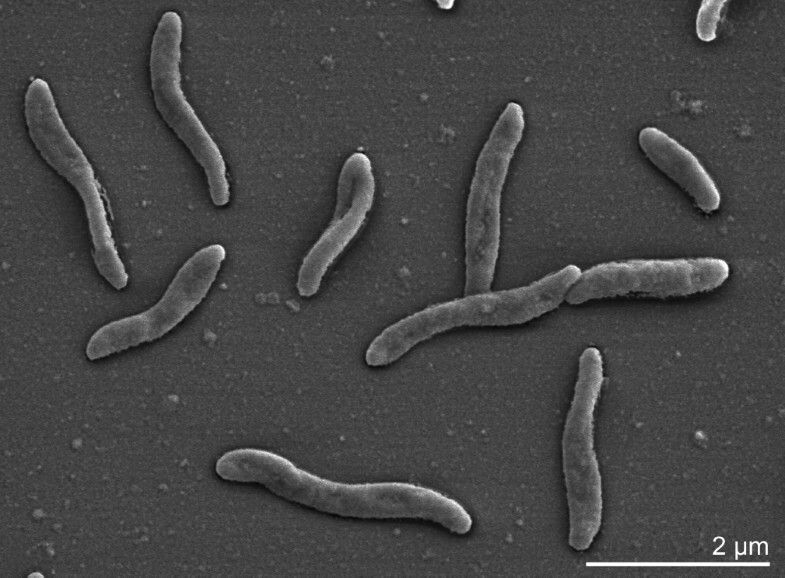 Altogether, the genus Sulfurospirillum contains seven species . Strain 5175T was isolated from anoxic mud of a forest pond near Heinigen, Braunschweig area, Germany . It is unclear if further isolates of the species exist. Here, we present a summary classification and a set of features for S. deleyianum 5175T, together with the description of the complete genomic sequencing and annotation. There were several uncultured clone sequences known in INSDC databases with at least 98% sequence identity to the 16S rRNA gene sequence (Y13671) of strain S. deleyianum 5175T. These were obtained from lake material in Dongping, China (FJ612333), deep subsurface groundwater in Japan (AB237694), and from the mangrove ecosystem of the Danshui River Estuary of Northern Taiwan (DQ234237) . No significant matches were reported with metagenomic samples at the NCBI BLAST server (November 2009). Figure 1 shows the phylogenetic neighborhood of S. deleyianum 5175T in a 16S rRNA based tree. The sequences of the three 16S rRNA gene copies in the genome of S. deleyianum 5175T differ from each other by no more than one nucleotide, and differ by no more than one nucleotide from the previously published 16S rRNA sequence (Y13671). Phylogenetic tree highlighting the position of S. deleyianum 5175T relative to the other type strains within the genus and the type strains of the other genera within the class Epsilonproteobacteria. 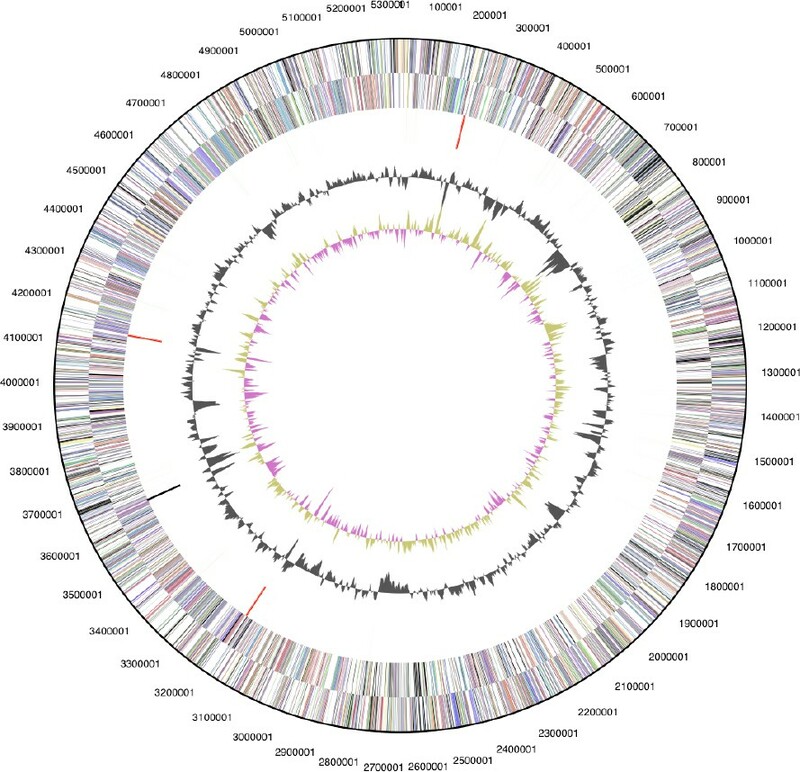 The tree was inferred from 1,326 aligned characters [5,6] of the 16S rRNA gene sequence under the maximum likelihood criterion  and rooted with the Nautiliales. The branches are scaled in terms of the expected number of substitutions per site. Numbers above branches are support values from 450 bootstrap replicates if larger than 60%. Lineages with type strain genome sequencing projects registered in GOLD  are shown in blue, published genomes in bold. The cells of strain 5175T are curved spiral rods of approximately 0.3–0.5 µm width and 1.0–3.0 µm length , with polar flagellation (Table 1 and Figure 2). Colonies are yellow-colored as a result of a flexirubin-type pigment . The cells contain cytochrome b and c . Strain 5175T is unable to rapidly decompose H2O2 (i.e. is catalase negative), does not need special growth factors (vitamins or amino acids), and is positive for oxidase . Strain 5175T grows anoxically with hydrogen, formate, fumarate, and pyruvate, but not lactate, as electron donor; acetate and hydrogen carbonate as carbon source and one of the following electron acceptors: nitrate, nitrite (which is reduced to ammonia), sulfite, thiosulfate, elemental sulfur (reduced to sulfide), dimethyl sulfoxide (reduced to dimethyl sulfide), fumarate, malate and aspartate (reduced to succinate) [1,18]. Sulfate is not reduced. Fumarate and malate can be fermented . Strain 5175T is able to grow microaerobically at 1–4% oxygen, but not at 21% oxygen . The substrates utilized for microaerobic growth are succinate, fumarate, malate, aspartate, pyruvate, oxoglutarate, and oxaloacetate . There is no oxidation of glycerol or acetate . An assimilatory sulfate reduction is lacking, and a source of reduced sulfur, e.g. sulfide  or L-cysteine, is required for growth . Further characteristics of the sulfur respiration of strain 5175T have been studied in detail [4,20]. Evidence codes - IDA: Inferred from Direct Assay (first time in publication); TAS: Traceable Author Statement (i.e., a direct report exists in the literature); NAS: Non-traceable Author Statement (i.e., not directly observed for the living, isolated sample, but based on a generally accepted property for the species, or anecdotal evidence). These evidence codes are from of the Gene Ontology project . If the evidence code is IDA, then the property should have been directly observed by one of the authors or an expert mentioned in the acknowledgements. Observations of ferric iron-reducing bacteria indicated that ferrihydrite was reduced to ferrous iron minerals via sulfur cycling with sulfide as the reductant. Ferric iron reduction via sulfur cycling was investigated in more detail with strain 5175T, which can utilize sulfur or thiosulfate as an electron acceptor . In the presence of cysteine (0.5 or 2 mM) as the sole sulfur source, no (microbial) reduction of ferrihydrite or ferric citrate was observed, indicating that S. deleyianum is unable to use ferric iron as an immediate electron acceptor . Interestingly, with thiosulfate at low concentration (0.05 mM), growth with ferrihydrite (6 mM) was possible, and sulfur was cycled up to 60 times . An interesting syntrophism between strain 5175T and Chlorobium limicola 9330 has been reported . The substrate formate is not metabolized by Chlorobium, and the limiting amount of sulfur is alternately reduced by strain 5175T and oxidized by Chlorobium . With respect to utilization of nitrate as terminal electron acceptor (dissimilatory nitrate reduction)  the dissimilatory hexaheme c nitrite has been studied in more detail. These include both structural and functional aspects [23–26]. Also, strain 5175T is able to use alternative electron acceptors. Strain 5175T is able to reduce the quinone moiety of anthraquinone-2,6-disulfonate (AQDS) and also to oxidize reduced anthrahydroquinone-2,6,-disulfonate (AH2QDS) as well . Additionally, oxidized metals may be used as terminal electron acceptors, such as arsenate [As(V)] and manganese [Mn(IV)], but not selenate [Se(VI)] or ferric iron [Fe(III)] . The predominant menaquinone is MK-6 (88%), with small amounts of thermoplasmaquinone with six isoprene units (TPQ-6; 10%) and MK-5 (2%) . The polar-lipid fatty acid composition is 16:1ω7c (52.0%), 16:0 (29.2%), 18:1ω7c (17.2%), 15:0 (1.1%), and iso16:1 (0.6%) . This organism was selected for sequencing on the basis of its phylogenetic position, and is part of the Genomic Encyclopedia of Bacteria and Archaea project . The genome project is deposited in the Genomes OnLine Database  and the complete genome sequence is deposited in GenBank. Sequencing, finishing and annotation were performed by the DOE Joint Genome Institute (JGI). A summary of the project information is shown in Table 2. S. deleyianum 5175T, DSM 6946, was grown anaerobically in DSM medium 541  at 28°C. DNA was isolated from 0.5–1 g of cell paste using Qiagen Genomic 500 DNA Kit (Qiagen, Hilden, Germany) following the manufacturer’s protocol with modification st/L for cell lysis as described in Wu et al. . The genome was sequenced using a combination of Sanger and 454 sequencing platforms. All general aspects of library construction and sequencing can be found at http://www.jgi.doe.gov/. 454 Pyrosequencing reads were assembled using the Newbler assembler version 1.1.02.15 (Roche). Large Newbler contigs were broken into 2,525 overlapping fragments of 1,000 bp and entered into assembly as pseudo-reads. The sequences were assigned quality scores based on Newbler consensus q-scores with modifications to account for overlap redundancy and to adjust inflated q-scores. A hybrid 454/Sanger assembly was made using the phrap assembler. Possible mis-assemblies were corrected with Dupfinisher or transposon bombing of bridging clones . Gaps between contigs were closed by editing in Consed, custom primer walk or PCR amplification. A total of 471 Sanger finishing reads were produced to close gaps, to resolve repetitive regions, and to raise the quality of the finished sequence. The error rate of the completed genome sequence is less than 1 in 100,000. Together all sequence types provided 34.42× coverage of the genome. The final assembly contains 23,491 Sanger and 296,611 pyrosequence reads. The genome consists of a 2,306,351 bp long chromosome with a 39.0% GC content (Table 3 and Figure 3). Of the 2,343 genes predicted, 2,291 were protein coding genes, and 52 RNAs. A total of 26 pseudogenes were identified. The majority of the protein-coding genes (72.9%) were assigned with a putative function while those remaining were annotated as hypothetical proteins. The distribution of genes into COGs functional categories is presented in Table 4. We would like to gratefully acknowledge the help of Petra Aumann in cultivation of the strain and Susanne Schneider for DNA extraction and quality analysis (both at DSMZ). This work was performed under the auspices of the US Department of Energy’s Office of Science, Biological and Environmental Research Program, and by the University of California, Lawrence Berkeley National Laboratory under contract No. DE-AC02-05CH11231, Lawrence Livermore National Laboratory under Contract No. DE-AC52-07NA27344, Los Alamos National Laboratory under contract No. DE-AC02-06NA25396, and Oak Ridge National Laboratory under contract DE-AC05-00OR22725, as well as German Research Foundation (DFG) INST 599/1-1 and SI 1352/1-2. Biological Agents. Technical rules for biological agents www.baua.de TRBA 466.